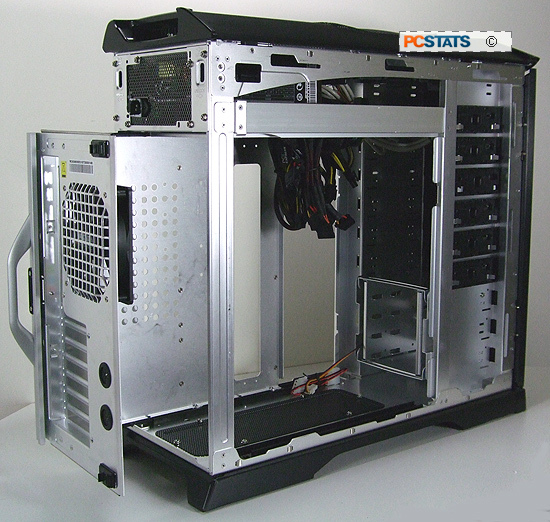 Abstract: Today PCSTATS is checking out the massive CM Stacker 830 SE - an elegantly designed full size ATX case that just looks awesome. 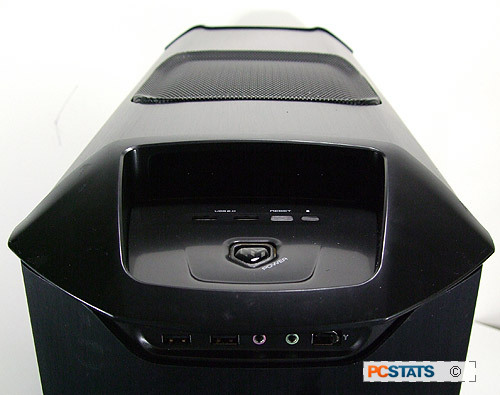 If you're an enthusiast computer user who's into cooling, you're going to absolutely love the Cooler Master Stacker 830 SE. The case comes with two 120mm fans pre-installed (one exhaust, one intake) and get this, it has space for another five 120mm fans! Think of the airflow! Your Crossfire'd or SLI'd videocards definitely won't have a heat problem with this bad boy. Let's not forget that the case is also watercooling capable. The front bay covers are aluminum mesh, with a filter to cut down on big dust bunnies. In general working with the Cooler Master Stacker 830 SE is a breeze, and installing most components into the case won't even require screws. For instance removing the motherboard tray is as easy as undoing two thumb locks and pulling on the motherboard tray handle. Nice that you don't have to remove the expansion slots to take the tray out first. Installing 5.25" devices also does not require any tools. 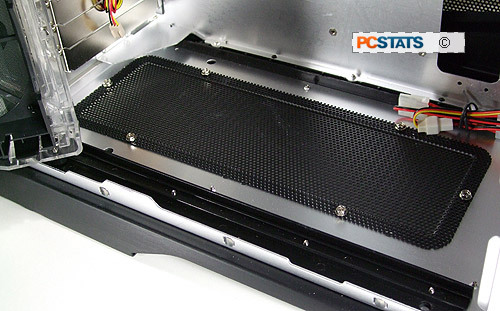 Removing the motherboard tray from the Cooler Master Stacker 830 SE without tools. A screwdriver is needed to install the hard drives, motherboard or to access the PSU. The side fan cage holds four 120mm fans in place and swings open like a door. If you're not going to be using fans, you can remove the whole cage. Cooler Master puts rubber dampers between the HDD cage and the case which helps reduce vibrations which is a nice touch. Removing the Stacker 830 SE's side panels is as easy as pulling them backwards, there are no screws to secure the sides. A little lock is set right next to the power supply to keep them in place, but in the unit PCSTATS received for testing these locks had fallen out. When transporting the Stacker 830 SE case around, you might want to secure the side panels with a little tape. If there is a design bug with the Stacker 830 SE, this is it. Top exhaust fan port right behind the power supply bay. Unlike most cases which are mainly enclosed, there are fan grills on every side of the Stacker 830 SE. From the sides, front, top and even bottom, that means that your system will always have access to the cool air outside case. Of course there's a lot of openings, so you're going to want to choose quieter fans as louder models will be more easily heard with the Cooler Master Stacker 830 SE. 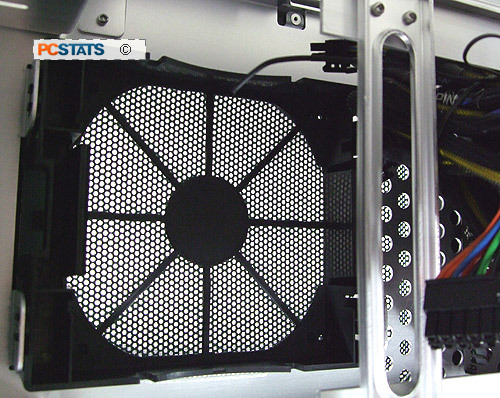 Every fan except for the rear exhaust has a filter which cuts down the amount of dust and debris that gets into the case. Bottom air intake grill allows cool air to flow through the Stacker 830 SE more easily. We're happy to see that Cooler Master places four USB 2.0 ports on the front of the case. There are a ton of USB devices on the market and having plenty of front panel ports really does make life easier. The power and reset buttons are on the top of the case near the front. There you'll also find the status LEDs (power and HDD). Power and reset buttons are placed at the top front of the Stacker 830SE case, right by the hand-hold. 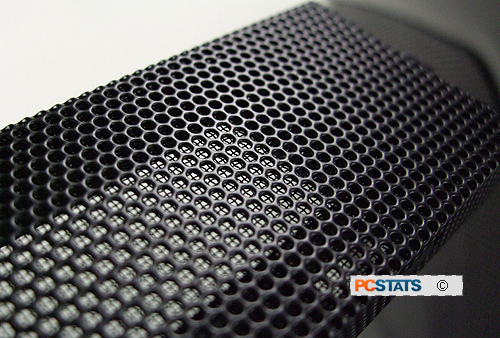 An aluminum mousepad is supplied with the that Cooler Master Stacker 830 SE case, along with wheels for the bottom, some extra fan brackets, front-panel 3.5" adaptors and a bag of necessary screws. The mousepad is actually pretty good and can be used for gaming purposes. The semi rough surface makes it easier for the laser to track movements and when we ran Crysis the game tracked pretty well.